Unionized workers of public broadcaster KBS said on Aug. 20 they have voted to walk off the job should a pro-government figure be appointed as their new chief, following President Lee Myung-Bak's dismissal of the network's liberal president. 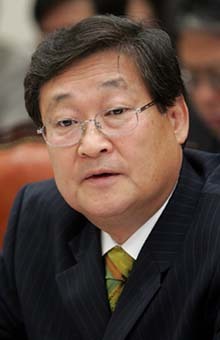 Jung Yun-Joo, the former KBS head, was sacked by Lee last week and faces trial on breach of trust charges. The KBS board of directors were in talks to pick their favorite among the 24 candidates for the brodcaster's top position by this weekend. Lee will make his final choice based on the board's recommendation. Media figures and liberals fear the board will choose a pro-government figure backed by Lee, following a pattern set by news channel YTN, English broadcaster Arirang and satellite broadcaster SkyLife. The KBS unions held a week-long vote, in which 85.5 percent of those who cast ballots — 3,043 people out of 3,560 — agreed to go on strike in the case of a politically motivated appointment. KBS has a total of 4,337 union members. "This vote manifests our union members' determination to go on strike if the Lee Myung-Bak administration appoints a 'parachute' president," the KBS unions said in a joint statement, using a phrase that refers to the top-down appointment of external players. Media industry observers say the competition is mainly a three-way race between Lee Byung-Soon, president of affiliate KBS Business, Kim Eun-Ku, a former KBS executive, and Sohn Byung-Doo, president of Sogang University and a former business CEO. Lee's appointment is expected by early next week. Prosecutors indicted Jung on Wednesday for causing substantial financial losses to KBS during his five years as its chief. The left-leaning former print journalist, appointed in 2003 by then President Roh Moo-Hyun, has been at odds with the new conservative government's pro-business and pro-U.S. policies since it was inaugurated in February. The row hit a peak following the government's decision in April to lift a ban on U.S. beef imports. The broadcaster aired programs critical of the administration's top-down decision-making and its sidestepping of domestic consultation. Government officials denounced the coverage as biased. "It is time for KBS to be born again," Lee was quoted as saying by his spokesman Lee Dong-Kwan as he signed Jung's dismissal motion last week.